As the capital of the United Kingdom, and with a history going back to the Roman times, London has obvious potential for tourism. As long ago as 1851, long before London Transport had come into existence, London hosted the Great Exhibition at the Crystal Palace in Hyde Park. In 1951 a new exhibition entitled the Festival of Britain was held on the South Bank of the Thames, between Waterloo Bridge and County Hall to mark one hundred years since the original. Described as ‘A Tonic to the Nation’ and running for six months, the Festival of Britain was a great success, a time for rejoicing after the rigours of war (although rationing was still in force). Over 8 million visitors attended this and also the Festival Pleasure Gardens at Battersea, and almost all used public transport. From 11 May four London Transport RT buses, which had toured Europe the previous year to publicise the event, inaugurated the Circular Tour of London. The fare was 2s6d (12.5p) and the conductor used a public address system. Tourism again blossomed with the Coronation in 1953. But after this the tourist market was not a priority, although the sightseeing tour continued each year. In 1967 a ‘London Sightseeing Round Tour’ 20 mile, 2 hour tour was being offered with six journeys a day starting from Victoria. It ran from Good Friday until October at a fare of five shillings (25p) for adults, half price for children. In 1968 this became the more logically sounding ‘Round London Sightseeing Tour’ and the fare had increased to six shillings (30p). 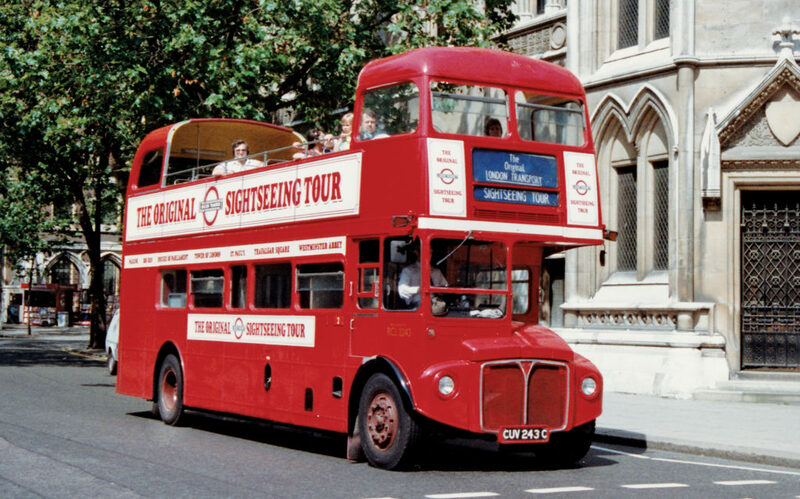 In 1970 the Round London Sightseeing Tour carried 325,000 passengers. In 1971 the tour operated on a daily basis (except Christmas Day). From 3 April tours ran every hour from 10.00am to 9.00pm, for the first time from two departure points – Piccadilly Circus and Victoria. It was not pre-booked but on a turn up and go basis and the fare was now 50p for adults, 30p for children. Services were operated by Samuelson New Transport Co. Ltd. on behalf of LT. In 1972 Britain joined the European Communities (European Union from 1993), eventually enabling visa less travel from other member countries. 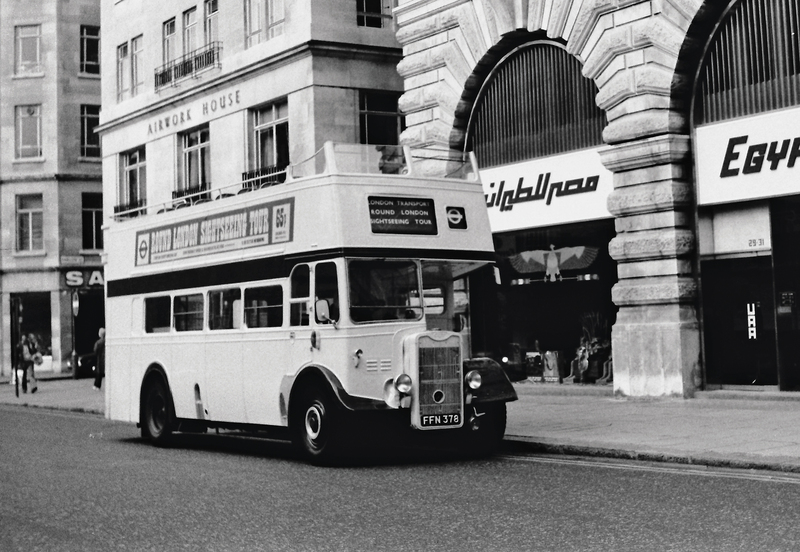 It was also in 1972 that London Transport ‘tested the water’ for an open-top tourist service by hiring five 1951 Guy Arab IIIs from East Kent. East Kent provided the drivers and LT the conductors. Also in 1972 London Transport hired Obsolete Fleet’s preserved former Tilling 1930 AEC Regent ST922 on a daily 45 minute circular route 100 from Horse Guards Parade. This was crewed by LT and sponsored by Johnnie Walker whisky, whose adverts it carried. Both operations were obviously deemed a success, for in 1975 Obsolete Fleet supplied seven open-top former Midland Red D9s to London Transport, painted LT red. 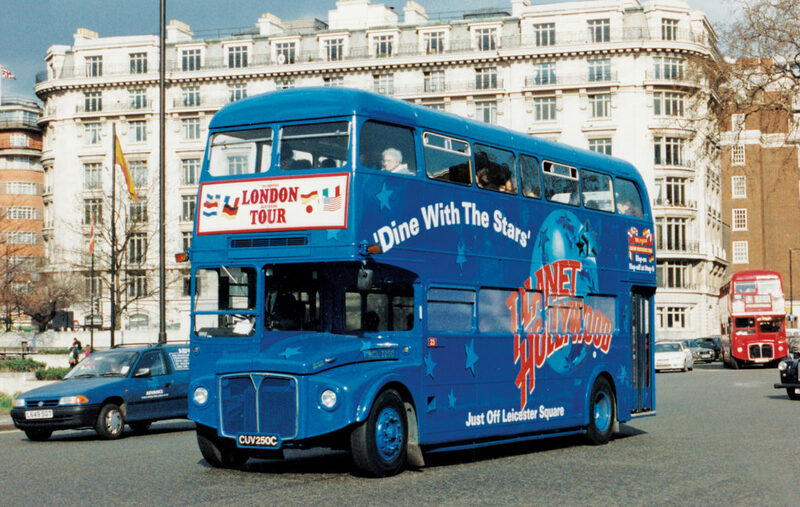 These vehicles supplemented LT’s own Daimler Fleetlines, used on the Round London Sightseeing Tour since 1973. In 1974 more than 600,000 passengers were carried. In 1978 the D9s were replaced by a batch of seven convertible Daimler Fleetlines bought by London Transport from Bournemouth Corporation, the DMO class. The 1970s and early 1980s were a difficult time for bus operators with supply problems and poor industrial relations within the manufacturing industry. The Sightseeing Tour was not top priority so vehicles were hired from a number of sources to run this, supplementing their own vehicles. The hired vehicles were painted in LT red, but some had no indication of the ownership or function other than a paper ‘on hire to London Transport’ notice. Deregulation of coach and express services in 1980 allowed other operators to openly compete with London Transport on sightseeing services, unlike bus routes where LT had a monopoly. These competitors not only directly copied the pattern of tour that LT operated, they also introduced a number of new innovations, including ‘Hop-on, Hop-off’ tours and multilingual taped commentaries. Even so, by 1982, the RLST was generating some £60m to LT’s income. From June 1984 London Regional Transport took over London Transport from the GLC. Then from 1 April 1985 a new wholly owned subsidiary, London Buses Ltd took on the operation of buses. In 1986 there was a rethink on sightseeing operations. As tourists regarded the Routemaster as the iconic London bus it was decided that these should be used on the sightseeing tour rather than the latest vehicles or hired buses. Fifty Routemasters were overhauled at Aldenham Works to replace the Metrobuses and hired vehicles on the RLST. They were given original style livery with cream band and gold underlined fleetname. Twenty RMs were converted to open-top, while nineteen retained their roofs for use in winter or inclement weather. The other eleven were RCLs which retained their roofs and regained doors. The route was rebranded as ‘The Original London Transport Sightseeing Tour’ (TOLST), and adult tickets now cost £5. It was still a non-stop tour, but starting points were now at Victoria, Haymarket, Baker Street and Marble Arch. Also in 1986 London Buses made their first attempt at a Hop-on, Hop-off service with Touristlink route T2. Starting on 7 June this was a circular route taking in most of the tourist sites including the Tower of London, British Museum, Madame Tussauds, Kensington and Hyde Park, with an all-day flat fare of £2 (children £1) and a short hop fare of 50p (children 25p). In April 1989 London Buses was split into regional operating units, plus London Coaches who ran the sightseeing operation. This was in preparation for eventual privatisation in the 1990s. When Privatisation took place, the London Coaches unit was sold in May 1992 to a management buy-out. However the company has changed owner twice since then. Of the many companies that joined in the competition from the 1980s, some were to be short-lived, being absorbed by other competitors, while others stayed the course to become major players. In more recent times, new companies have entered the market with varying success. Some of these have created new niche markets such as tours of haunted London or tours with afternoon tea served en-route. A mix of new and second-hand vehicles continue to provide the tours – even some Routemasters can still be found on tour work. 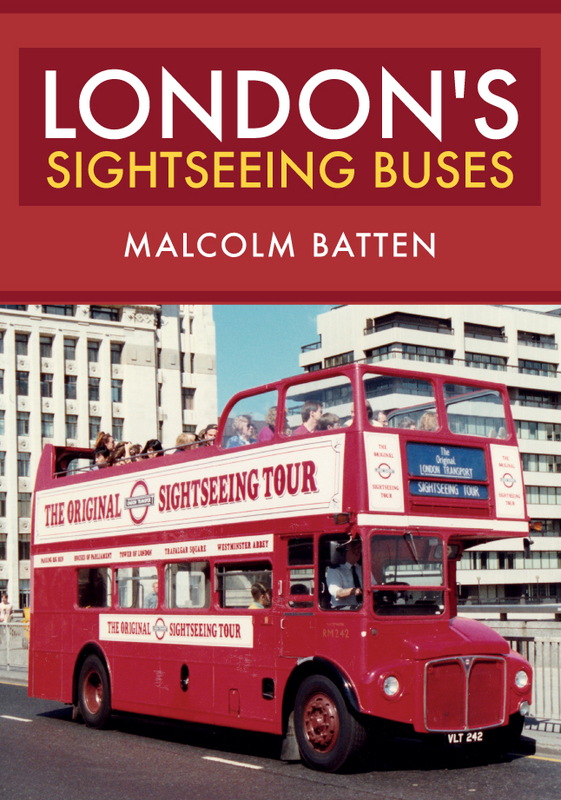 Malcolm Batten's new book London's Sightseeing Buses is available for purchase now. This entry was posted in Blog and tagged Sightseeing Buses, London's Sightseeing Buses, Malcolm Batten, Buses, Road Transport, London, Local History, Amberley Publishing on February 28, 2019 by Amberley Publishing.